We have also given guidance to assist investors and borrowers which you can find on our MoneySmart website. The focus of this information sheet is on the obligations that are relevant to products structured as a managed investment scheme, which we have found to be a commonly used business model for marketplace lending in Australia at this time. The guidance in this information sheet may also be relevant to marketplace lending providers that use other business models. We welcome further discussion with marketplace lending providers about their proposed business model or the guidance provided in this information sheet. If your business is a start-up you may also request further guidance through ASIC's Innovation Hub. Our guidance refers to the legislative and policy settings that currently apply. As marketplace lending develops in Australia the legislative and policy settings in this area may be subject to change. We will review the guidance as appropriate in response to any future changes in the law, policy settings or business structures. Marketplace lending generally describes an arrangement through which retail or wholesale investors invest money (seeking to earn a return) which is then lent to borrowers (consumers or businesses). Marketplace lending arrangements commonly involve the use of an online platform, such as a website, on which loan requests are made. The loan requests may then be matched against offers to invest. Investors either select the loans they wish to invest in or they are matched with loans that meet specified criteria, such as a prescribed or desired interest rate and loan term. In some arrangements, investors may also be exposed to a loan or a pool of loans. Multiple investors may also fund a single loan. Although some forms of marketplace lending have often been referred to as 'peer-to-peer lending' or 'P2P', we consider 'marketplace lending' more appropriately describes these lending arrangements, and encourage the use of this term. Neither marketplace lending nor peer-to-peer lending is a defined legal term. However, providers need to take care that the way they describe their marketplace lending product is not misleading or deceptive. If the product is referred to in a way that is misleading or deceptive we may take action as appropriate. risk that investors and borrowers do not have sufficient understanding of the marketplace lending product when deciding to participate. Marketplace lending providers should ensure that investors and borrowers are informed of all relevant risks. We also refer you to the guidance we give to investors and borrowers on relevant risks on our MoneySmart website. an Australian credit licence if the loans made through the platform are consumer loans (e.g. loans to individuals for domestic, personal or household purposes). As with other financial products regulated under the Corporations Act 2001 (Corporations Act), there are requirements to ensure that retail investors have access to sufficient information to make an informed decision about whether or not to invest. There are also requirements that disclosure and promotional material must not include any misleading or deceptive representations – see the guidance under the heading 'Advertising of marketplace lending products'. Where the loans made through the platform are consumer loans, the marketplace lending provider will need to comply with requirements in the National Consumer Credit Protection Act 2009 (National Credit Act) and the National Credit Code (which is contained in Schedule 1 to the National Credit Act). For all loans (including loans for a business purpose that are not regulated under the National Credit Act) consumer protection provisions in the Australian Securities and Investments Commission Act 2001 (ASIC Act) apply, including prohibitions on misleading or deceptive representations and use of harassment and coercion in recovering payments. If the marketplace lending product is offered to investors who are retail clients using a managed investment scheme structure, the operator (i.e. the responsible entity) of the scheme will need to register the scheme with ASIC: see section 601ED. The responsible entity of a registered scheme must be a public company that holds an AFS licence authorising it to operate the scheme (see section 601FA) and any other financial services provided in operating the scheme. lodge with ASIC a written breach report as soon as practicable (and within 10 business days) after becoming aware of a breach or likely breach of certain obligations that is significant (see Regulatory Guide 78 Breach reporting by AFS licensees (RG 78)). the duties of the officers and employees of the responsible entity: see sections 601FD and 601FE. These duties include that the officers of the responsible entity act in the best interests of the members of the scheme and that officers and employees not make use of information acquired to gain an improper advantage or cause detriment to the members. The AFS licence, ASIC Form 5100 Application for registration of a managed investment scheme, scheme constitution and compliance plan should outline that the scheme's purpose is to facilitate marketplace lending and include a summary description of the scheme's structure. If a managed investment scheme is only made available to investors that are wholesale clients (as defined in the Corporations Act) it does not need to be registered. The marketplace lending provider will need an AFS licence that covers any financial product advice, dealing, or custodial or depository financial services activities undertaken in relation to the scheme, unless an exemption applies. However, the provider may still need an authorisation for custodial or depository services even where a custodian with an AFS licence that covers custody is appointed to hold the scheme assets (RG 166). Do any licensing exemptions apply? To operate a registered or unregistered managed investment scheme and issue interests, the marketplace lending provider will generally need its own AFS licence to provide the financial services. We are aware that some marketplace lending providers may seek to rely on exemptions from holding an AFS licence under the Corporations Act (in particular the exemptions under section 911A(2)(a) (acting as a representative) and section 911A(2)(b) (relying on an intermediary authorisation)). We consider that there are limitations on the use of these exemptions from holding an AFS licence. These limitations prevent marketplace lending providers from operating a managed investment scheme and issuing interests in the scheme in reliance on these exemptions. If consumer loans are offered through a marketplace lending platform, the persons involved in entering the loan and operating the platform will need an Australian credit licence (credit licence) and must comply with the requirements set out in the National Credit Act and National Credit Code. Business loans are not regulated under the National Credit Act and National Credit Code. providing credit services by suggesting a consumer apply for a particular loan, assisting a consumer to apply for a loan, or acting as an intermediary between the consumer and a credit provider to secure a loan. Marketplace lending providers need to consider how they have set up their platform, the different entities involved in operating the platform and the activities they engage in, who needs to hold a credit licence and what authorisations those persons will need. Credit licensees need to comply with responsible lending requirements set out in Chapter 3 of the National Credit Act. These requirements apply before a credit licensee enters a loan with a consumer or assists a consumer to apply for a loan. We have provided guidance on the circumstances in which the responsible lending obligations will apply and what those obligations involve in Regulatory Guide 209 Credit licensing: Responsible lending conduct (RG 209). use that information to assess whether the loan would be unsuitable for the consumer. 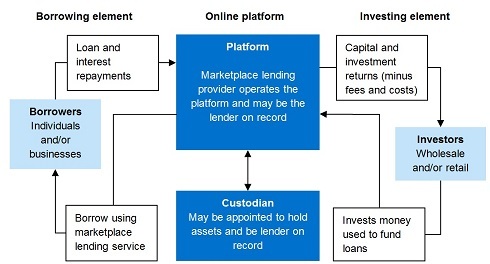 If a custodian is the credit provider for loans entered through a marketplace lending platform, and the marketplace lending provider is the person who assists consumers to enter those loans, both the custodian and marketplace lending provider will have their own responsible lending obligations (and liabilities if the obligations are not met). While in practice the marketplace lending provider may perform the inquiries, verifications and assessments for the custodian as its agent, the custodian will still be responsible for fulfilling these obligations. In addition to the assessment obligations, there are requirements to provide disclosure documents to consumers at various stages of the process of obtaining credit. We have provided information on the broader range of responsible lending disclosure obligations in RG 209 and Information Sheet 146 Responsible lending disclosure obligations - Overview for credit licensees and representatives. requirements for dealing with borrowers whose circumstances have changed and who are now unable to meet their repayment obligations because of hardship. These obligations apply to all credit providers who provide consumer loans, including credit providers who are exempt from holding a credit licence. Where debentures are issued to retail investors, a prospectus may need to be issued (see Chapter 6D of the Corporations Act) and, Chapter 2L of the Corporations Act will apply. Where the loans are debentures issued by borrowers, and the platform facilitates offers being made to investors to acquire these debentures, the product provider may be operating a financial market as defined in section 767A of the Corporations Act. This generally includes a facility through which offers to acquire or sell financial products are regularly made. In these circumstances, an Australian market licence or exemption will generally be required (for more information on when an Australian market licence is required, including the meaning of relevant terms such as 'regularly': see Regulatory Guide 172 Financial markets: Domestic and overseas operators (RG 172 )). Where the marketplace lending provider issues securities (other than debentures) with an economic exposure based on particular lending arrangements, a prospectus may be required: see Chapter 6D of the Corporations Act. Marketplace lending providers will need to ensure that they understand and comply with the obligations relevant to their particular business structure. In particular circumstances a marketplace lending provider may be able to demonstrate that it would be unreasonably burdensome to comply with a requirement under the Corporations Act or National Credit Act and Code. ASIC has discretionary powers to give relief from the requirements of the Corporations Act and National Credit Act and Code. Guidance on how to make an application for relief, and information that should be included in an application is set out in Regulatory Guide 51 Applications for relief (RG 51) and other relevant regulatory guides such as Regulatory Guide 136 Managed Investments: Discretionary powers and closely related schemes (RG 136). relief from the requirement to treat the underlying assets of a provision fund operated in connection with the lending platform as scheme property of the scheme. For additional information see Report 435 Overview of decisions on relief applications (October 2014 to January 2015). if there is a source of protection for investor losses such as a derivative, guarantee or provision fund, how this is funded and when it can be accessed by investors. We recognise that advertising content and delivery have an important role in attracting investors and promoting a marketplace lending product's benefits and features. It is important that 'promoters' ensure that advertising material is clear, accurate and balanced. A promoter includes the product issuer, credit provider and can be a third party such as a financial adviser, credit service provider, distributor or agent. We note that promoters of financial products, financial advice services, and credit products and services, have a legal obligation to not make false or misleading statements or engage in misleading or deceptive conduct in relation to these products and services. This includes the promotion of marketplace lending products and services. It is also important that investors are encouraged to seek further information about the product – in particular, by reading the PDS before deciding to invest. Under the Corporations Act, if the product is promoted to retail investors, the content of advertising or other promotional material must indicate that a PDS is available, where it can be found, and that the investor should consider the PDS in making decisions about acquiring the product (section 1018A). If the advertising implies it is giving an overall summary of the key features of the product, it does not merely focus on the benefits of the product (e.g. that the borrowers are creditworthy, that attractive returns may apply from investing in the product, and the speed and ease of online lending and borrowing) but also addresses the risks. Comparisons with other products are clearly explained. Comparisons with dissimilar products that falsely imply similarity, and use of terminology that could create a false and misleading impression about the product are avoided. Any reference to ratings of borrowers' creditworthiness does not create a false and misleading impression that they are similar to ratings issued by traditional credit rating agencies. For this reason, alphanumeric ratings that are similar to those used by traditional credit rating agencies (e.g. AAA and BBB) should not be used to describe the creditworthiness of borrowers in the context of marketplace lending. To the extent that marketplace lending promoters wish to describe the creditworthiness of borrowers quantitatively, any quantitative description should be accompanied by qualitative information to explain what the quantitative descriptor means. While marketplace lending offers borrowers an alternative to borrowing money from other sources, such as a bank, it would not be appropriate for any comparison to be made between marketplace lending products offered to investors with products offered to consumers of banking products, such as saving accounts and term deposits. Words such as 'savings', 'saver' or other terms used in relation to banking products should be avoided in advertising or disclosure for marketplace lending products. In comparing interest rates or returns that investors may earn by investing in marketplace lending, it is important the comparisons do not create an impression that the product's returns are comparable to term deposits or other banking products. That investors understand upfront the role they have in selecting the particular borrower that they are matched to, particularly, in circumstances where the platform facilitates the selection of the borrower (which may be consumer or a business). In addition to the disclosure in the PDS, it is important for the advertising and interface with investors to provide clear and meaningful disclosure to highlight to investors that their investment may be exposed to a consumer and/or a business loan, and that the selection of the particular borrower will be facilitated by the platform and not the investor. Marketplace lending providers may facilitate secured loans. In such cases, providers would be expected to take all reasonable steps to register and protect any security interests, including registration on the Personal Property Securities Register or, if appropriate, the Torrens Title Register. Failing to correctly register the security may be inconsistent with the marketplace lending provider's duties as a responsible entity. We consider that marketing loans as secured loans when they are not, or marketing the loans as secured when the security has been incorrectly registered or it has negligible value, would be misleading. aggregated information about the loan book such as interest rates, loan amounts, term of the loans and whether loans are secured or unsecured. We also encourage marketplace lending providers to read the information in Report 429 Cyber resilience: Health check (REP 429) on managing online fraud and other cyber risks. These good practice examples are not intended to be exhaustive. We encourage the marketplace lending industry to establish and implement standards and good practices for the industry as marketplace lending continues to develop. This will help build and maintain confidence in marketplace lending generally. This is Information Sheet 213 (INFO 213), issued in March 2016. Information sheets provide concise guidance on a specific process or compliance issue or an overview of detailed guidance. The full range of credit activities is set out in the table in section 6 of the National Credit Act. We have provided guidance on what types of conduct constitute credit activities in Regulatory Guide 203 Do I need a credit licence? (RG 203). ASIC has provided guidance on the National Credit Code obligations, including on hardship variations and debt collection practices (see Information Sheet 105 FAQs: Dealing with consumers and credit and Regulatory Guide 96 Debt Collection Guideline: For collectors and creditors (RG 96)).